The new Fossil Serving Platter is sure to be a conversation starter! They are available in 2 sizes. Small (8.5" x 12") for $20.00 and Medium (12" x 17.5") for $40.00. 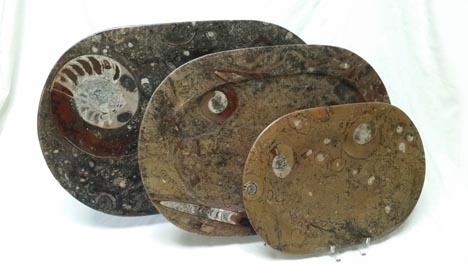 These lovely platters are sculpted from Orthoceras and Ammonite fossils in matrix that have been polished smooth. Very limited supply, so order while they last!! !